This floral-powdery scent was designed to recall the joys of a walk in the country, the sunshine after the rain, and walking barefoot through wet grass. There are 86 reviews of Après L'Ondée Eau de Toilette. 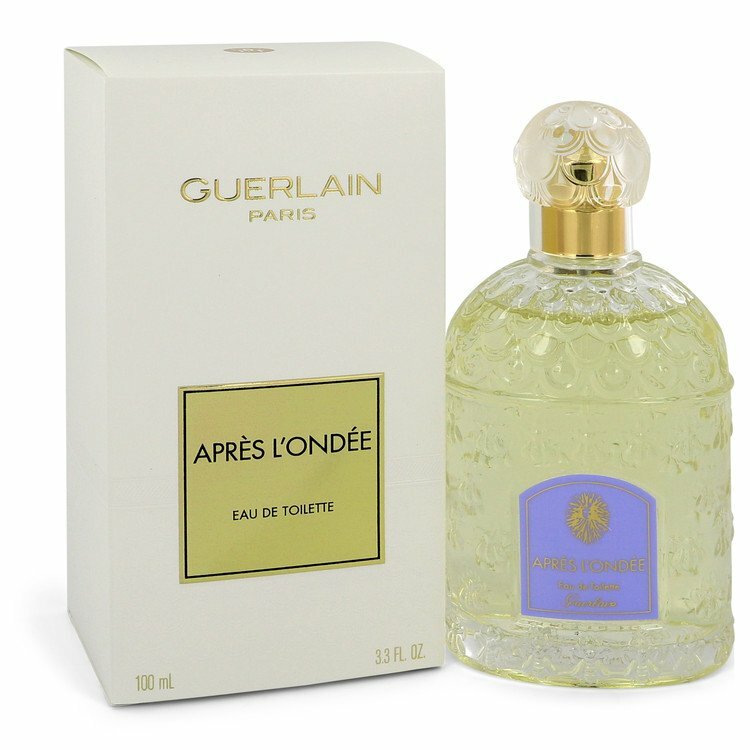 Guerlain Après L'Ondée (1906) is not the first fragrance from the late and great Jacques Guerlain, but it is often considered his first breakthrough commercial success for the house, after such entries as Mouchoir de Monsieur (1904) and Fleur Qui Meurt (1901), the latter only existing as a name mentioned anecdotally online as most surviving examples remain in museums un-smelled by us common perfume fans. Unlike older turn-of-the-century Guerlains made by Jacques that remain in either limited distribution or not at all, Après L'Ondée (or "After the Rain" in French), would become the first perennial favorite of the house after the controversial Jicky (1889). Après L'Ondée was meant to smell like it sounds, as a garden of flowers after a freshly-fallen rain, and the scent carries a light dewy ephemeral quality that makes it hard to over-apply. Jacques showed his interest in building perfumes out of other perfumes he's made very early on with Après L'Ondée, as the core structure of Fleur Qui Meurt (or "Flower that Died" in French) was carried over to it, in which this case was a newly-synthesized violet accord. Combining this violet with an equally-new heliotrope accord (from heliotropin) and an anisic aldehyde, Jacques created a bright and crisp floral bouquet that nobody had seen at the time, laid upon a bed of a orris root and eugenol (clove). There was a lot of science going on in Après L'Ondée that not many wearers of the perfume were aware of, but the results of this orchestration led to an aroma copied then copied again by competitors much like the later Shalimar (1925) would be, making Après L'Ondée feel a bit ubiquitous in the modern day but no less quality. The opening of Après L'Ondée is that aldehydic anise accord combined with orange blossom and a touch of damask rose. The literature of the day described Après L'Ondée as melancholic, and I can totally see it by the visions of a wet garden on an overcast day that the opening implies. The violet comes next, as does a lovely carnation note which helps connect the violet to the heliotrope and a dry semi-fruity hawthorn note flitting about through the heart. Finally, the orris root base shows up after some time on skin. There is an awful lot of orris in Après L'Ondée, so folks not fond of the note will likely not appreciate the final phases of this perfume, if they even made it past the powdery heliotrope in the heart anyway. The orris was flanked with a vanilla infusion and clove in early batches, but after the creation of vanillin some years later, was replaced by that synthetic to help with economy of scale. I can't vouch for what that vanilla infusion must have smelled like, since I only have a more-recent batch in my midst, but what I get here is a soft vanillic soap which underpins all the light florals above, creating what society would perceive as the quintessential feminine accord for decades to come. The finish of Après L'Ondée is powdery, a bit soapy, with wisps of heliotrope, violet, and the fruit impression caused by the hawthorn, which lasts for a few hours on skin at modest sillage. I don't think Après L'Ondée was ever meant to be a "statement perfume" like the assertive Mitsouko (1919), and shares more DNA with the later L'Heure Bleue (1912), which takes the floral accord of Après L'Ondée in a more ambery semi-fougère direction appropriate for its evening aesthetic. I enjoy what is on display with Après L'Ondée, but admit that represents a "dainty" mindset of femininity not entirely acceptable over a century after it was made. Most modern noses won't perceive the melancholy that noses at the turn of the century seemed to pick up, and that is largely in part to the way every perfumer from department store to dime store created their own heliotrope and iris perfume throughout the 20th century in hopes of capitalizing on the trend set by Après L'Ondée, which is an unfortunate by-product of massive long-term success. Most notably, Avon would crank out iteration after iteration of ambery iris, carnation, and heliotrope perfumes in the US, further solidifying this accord as that of "old women" once sharper leathers, headier orientals, and tomboyish green oakmoss chypres came to the fore as the 20th century progressed. Après L'Ondée and all of its copycats would seem irrevocably dated in time, even if Après L'Ondée was considered novel upon creation, the origin of the species, and superior in most regards to its progeny. I give this an approval for being such a landmark perfume, but admit its interest for many will stem from an interest in perfume history, outside those who still relish the kind of quaint innocence on display with Après L'Ondée. Unisex appeal is rather low, making this one for the ladies, but transgender perfume enthusiasts or anyone that prefers soft, soapy, light, and somewhat transparent florals might find favor in Après L'Ondée as a great after-shower or casual summer refresher that lacks harsher modern chemical bite. For everyone else, this is just a window through time in perfume form before Jacques Guerlain really solidified the concept of "Guerlinade", and worth at least a sniff or two, if nothing else. Thumbs Up. When I first tried a sample of Après l'Ondée, about 10 years ago, I thought it was one of the most beautiful perfumes I'd ever smelled. I didn't get around to buying a bottle until about four years ago, though, at which point I had that strange sensation that sometimes happens when perfume memory and reality don't quite mesh. Especially since I'd been spending a lot of time with L' Heure Bleu—I found them to be redundant to each other, if that's the right way to put it. And, as it turns out, it's not just my nose making that assessment. As Guerlain admits on it's own site: "Guerlain creations each have their own story and sometimes strong similarities. This is the case of Après l'Ondée and L'Heure Bleue, two countryside fragrances inspired by the beauty of a moment and a photograph of nature. Created six years earlier, Après l'Ondée has a more watercolour and pastel aspect than L'Heure Bleue." Thankfully, the distinctions do become apparent enough to justify having both bottles, if only to note how skillfully Jacques Guerlain could push a certain theme. Whereas L'Heure Bleu becomes increasingly heavy on my skin, woody and sharp, with medicinal, pencil-shaving notes joining the florals, Après l'Ondée becomes softer and yet more spicy—a duet between iris and carnation. And ALO always wears like a cologne, never a perfume (it's hard to believe, in fact, that it ever came in an extrait version). If it's a really hot day, and if I spray enough of it, it will waft up and out for a good three to four hours at least. But in the cold, it stays very very close to the skin and disappears entirely after a few hours. I have sniffed hundreds of perfumes since I was first bowled over by ALO, and at times I'm nostalgic for that naiveté—that gut reaction to something, ignorant of history and experience. Regardless, this will likely always remain in my collection, if for no other reason than it's so pretty and wearable, so youthful and goodhearted, in a way that many Guerlains are not. This is an odd fragrance. I rarely give feminine frags negative or neutrals. Most are safe. This is a chemical smell. The iris and orris combine with the violet to cancel out most of the floral smell, and cause it to be chemical. Looking at the original date, I bet it smelled much differently when it wasn't altered by government control. A solid, multi-layered powdery scent. I've got sweet creamy violet, lower-pitch orris, an oily/muddy/spicy heliotrope, and some subtle mimosa tone. All of which is accompanied by high-pitched, chilly medicinal disinfectant notes, close to galbanum but not quite so. Styrax maybe? I honestly wonder why they put such note there. Since I don't know any french, I don't get the rain/water/moisture suggested by the name. It's fairly dry to me. If I stretch a bit, perhaps that medicinal note is mean to represent the soil after rain? Old school floral. Has been copied and is so ubiquitous that it smells cheap. A shame. There are no member images of Après L'Ondée Eau de Toilette yet. Why not be the first?